When you are in pain, not much else matters. You just want out of pain. You want it to go away and never come back again. Unfortunately, in my life, I have found things that do not work quite like what I wish they would. I’ve often found that I don’t have the answers I need, or if I think I do, very little helps. I have had moments where I struggled with migraines, stomach ulcers, paralysis, anxiety, and allergies. There have been moments where my muscles were so painful and stiff that I could barely move, let alone make it to the emergency room so they could inject muscle relaxers in me. I’ve had migraines that went on for days only to leave me in an emergency room seeking any high powered relief that I could beg for from the doctors. Significant rashes have covered my entire body and left me weeping on the floor. It was difficult to think that recovery would ever happen. I’ve had times when depression overwhelmed me and suicide appeared as my only option. In all of these times, I thought I would never find a way through both physical and emotional pain. When you are in pain, it is hard to be convinced that there is a way out. When you hear words of encouragement, it almost feels like someone is speaking a language you don’t know. It feels like they genuinely don’t understand. I’ll never forget the person in the wheelchair that I was trying to help one day. She looked at me as if I was bothering her and so I backed away from helping her. Her words to me were meant to sting, but she said, “you don’t know what it’s like being in a wheelchair!” I looked at her and replied, “oh, but I do!” Her heart melted a little when she discovered that I had once been paralyzed and had to struggle in a wheelchair. Sometimes we don’t realize in our pain that others have been in similar places . It is easy for the pain to cloud our judgment and mind, but we need to remind ourselves that others do understand. Even when you are in pain, there are others that are there for you, but if we push them away, we stand alone by ourselves. I also learned that when you are in pain, you may not find the resources for your condition that you feel should exist. When I went through Conversion Disorder and paralysis, there was no one saying if you do step 1, 2, 3 that you will recover. They were trying things and experimenting, but the medical field had no more clue about my recovery than I did. It showed me that I needed to help the medical world learn by helping myself. I could not rely on others for the answers, so I had to go searching for myself. I listened to what they said, but then I evaluated and tested what worked and what did not. If something worked, I embraced it as a stepping stone to understanding more. I did not use it as the stopping point in my recovery. It did not become my primary treatment plan. If something wasn’t working, I kept searching. There was no use in me pursuing that which did not work. However, I had to be careful not to give up too quickly and too easily. There might have been something that was promising that I would have missed. When you are in pain, your evaluation abilities do not always function at optimal capacity. Often, pain filters what we see going on in our body. I learned to give up what I thought I knew and allow myself to discover that which I did not know. It was not exactly easy to do because when you are in pain, you want answers. It is hard for you to allow yourself to search and discover. In the search and discovery, we find something more lasting and healing than if we take the quick fix though. Quick fixes and pain relief are not necessarily a bad thing. However, we too often stop after the quick fix or pain relief has been administered. We shun the pain as if it is our most hated thing in the world. That seems to make sense, but if we don’t go beyond the quick fix of pain relief, we’ll miss the bigger picture. It is in the bigger picture that we find lasting pain relief that is transforming in our lives. At one time, I thought I knew more than I did. 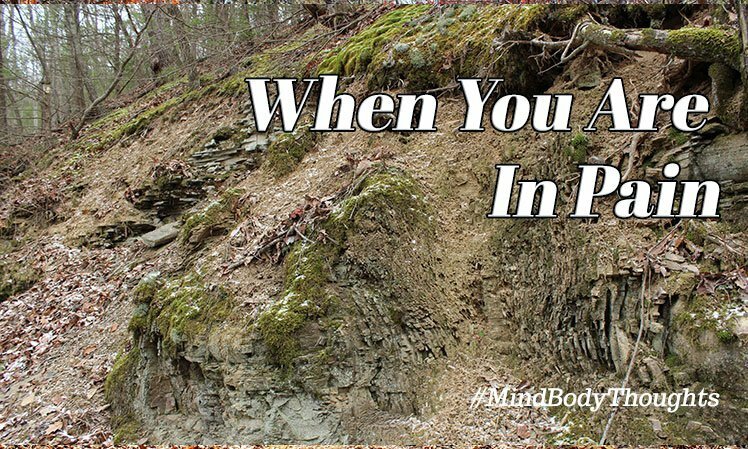 Soon, I realized that my discovery showed how little I understood in my mind body. Healing from pain isn’t just a thought process as many would lead you to believe. There is a source of it rooted deep in the body. Most likely it is cloaked by experiences and the emotions of your life. When you are in pain, the best thing you can do is look beyond what you see. It is on the outer edges that you will begin to discover what you need to know. It may appear dark and foggy. In fact, you may not even have the remotest idea of what is out there that will help you. Don’t stop searching! The more you embrace that which helps you, the more you will find what you need. Search for it from a place of deep internal awareness, and it will magnify your efforts.